Fast, calculative, very energetic and smart, Giannis Antetokounmpo is a respected professional basketball player of Greek origin who is renowned for his dazzling speed on the court. He has been often described as a young man who is constantly being eaten up and driven by an unquenchable desire to grow and accomplish incredible feats. In fact, his fans now refer to him as ‘The Greek Freak’ in recognition of his superb ability to handle the ball as well as his incredible athleticism. The star player plays for the Milwaukee Bucks of the NBA and is admired for his immense contribution to the club. His talents have helped him risen to become the club’s primary play-maker, winning many awards, most notably the Most Improved Player award in 2017. Giannis Antetokounmpo arrived on earth on the 6th of December, 1994 in Athens, Greece. He was born to a father identified as Charles Antetokounmpo and a mother named Veronica Antetokounmpo. Although a Greek national, Giannis also has Nigerian roots. This is because his mother and father are both Nigerians who migrated and settled in Greece to seek greener pastures. They migrated from Nigeria to Greece in 1991, about 3 years before the star player was born. There is no information available about Antetokounmpo’s childhood. It is, however, known that due to his family’s social status, the young man and his older brother had to hawk items on the street in order to help provide for his family. By 2007, he started playing basketball and two years later, he began playing competitively for Filathlitikos’ youth squad. The basketball player joined the senior men’s Filathlitikos team in 2012 and featured during the 2012-13 Season of the Greek A2 Basket League. During this time, Giannis stunned fans by scoring an average of 9.5 points in at least 26 games. When the 2012/13 season ended, he bagged a 4-year deal with Spanish club CAI Zaragoza. The more Giannis Antetokounmpo got better at his game, the more his fame grew and in April 2013, he was able to declare for the NBA draft to move to play in the United States. Giannis Antetokounmpo was selected as the 15th overall pick in the first round of the 2013 NBA draft by the Milwaukee Bucks. Following the signing of his rookie deal with the club in July 2013, he went on to stun fans and managers with his ability. In his rookie year, he was able to average 6.8 points, 1.9 assists, 4.4 rebounds and 0.8 blocks in as many as 77 appearances. He finished that season with 61 total blocks, which was a stunning feat that surpassed all the other NBA rookies that year, earning him a place on the 2013–14 NBA All-Rookie second team. The basketball star was not backing down. When the next season began, he succeeded in leading the Bucks to the playoffs by averaging 12.7 points and 6.7 rebounds per game. During one of those games, he set a then career-high record by scoring 27 points and securing 15 rebounds in a match against the Houston Rockets. This feat and others earned him the Eastern Conference Player of the Week honors. However, despite this brilliance, they were defeated during the playoffs by the Chicago Bulls. When the 2015-16 season began, Giannis showed great improvement in his game and his scoring ability. In fact, for the first 20 games of that season, he averaged 16 points per game. That same season, he recorded his first ever career triple-double during a win against the Los Angeles Lakers in which he scored 27 points, 10 assists, and 12 rebounds. That feat made him the youngest Milwaukee Bucks player ever to record a triple-double. Giannis started the 2016–17 season with a bang, scoring a game-high 31 points in a match against the Charlotte Hornets and shortly after that, he recorded his sixth career triple-double. For his exploits, he was named the Eastern Conference Player of the Week that December. He went on to amaze the division when he continued scoring at least 20 points in 14 consecutive games, tying the longest double scoring run ever by any Bucks star. In January 2017, he got selected for the 2017 NBA All-Star Game over his very impressive run during his 2015-2016 season outing. He was also honored with the NBA Most Improved Player Award. Giannis Antetokounmpo continued his exploits in the 2017/18 season when he averaged 26.9 points and 10.0 rebounds per game. That year he managed to become the very first Milwaukee Bucks player since Marques Johnson to ever get selected in two consecutive NBA All-Star Games. He started the 2018–19 season with a four-straight 25-point and 15-rebound performance and was honored with the Eastern Conference Player of the Week award. He went on to record five triple-doubles across different games and was named the Player of the Week six times. He was also named the Eastern Conference Player of the Month for February 2019. 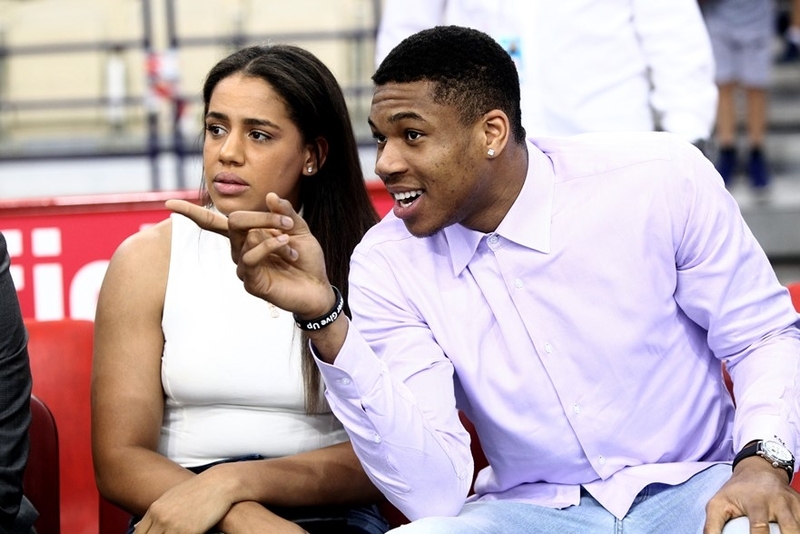 Giannis Antetokounmpo is currently dating a lady identified as Mariah Riddlesprigger. Like him, Mariah is also an athlete who plays Volleyball at Rice University in Houston, Texas. According to reports, the lovebirds both reside in Milwaukee are said to be head-over-heels in love with each other. Giannis has four siblings, three of whom play basketball today. His oldest brother identified as Francis was left back in Nigeria by his parents when they migrated to Greece. After they arrived in Greece and had found a place to stay, his parents had him and later three other brothers; Thanasis, Kostas, and Alex, who now actively play basketball. The family didn’t find it very smooth initially because, for about 20 years, none of them qualified to get full Greek citizenship so they had to hide from immigration police every time for fear of being deported. Eventually, life got better as time went by and the brothers started to play the game of basketball. Giannis Antetokounmpo is a very tall person and this is not surprising at all considering he is a basketball player. The young athlete actually towers over many of his peers with his rather domineering height that is listed at 6 feet 11 inches. He further weighs about 101 kg or 222 lbs.